In this post I will discuss how to create a simple pie chart using 3 popular libraries: D3, Google charts and Infographic Charts library. I will be looking at the pros and cons for pie chart created with each library. We will try to use the libraries such that the end result looks as similar as possible and then compare the code written to get the result. See the Pen D3 Piechart Example by Ion Emil Negoita (@inegoita) on CodePen. Here is the link to download & install D3 and the D3 documentation and examples. 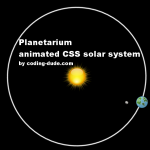 it’s free to download and use as you want and this library is released under BSD license. It has a relatively steep learning curve due to the wide range of applications and features it has. Conclusion about making a D3 pie chart: It took me a while to get my head around how D3 works and it takes a while to get used to the syntax. Also, I found it rather difficult to find my way through the huge documentation looking for a specific thing. The result looks nice a slick, however it lacks the tooltips for the slices. I could have added them but that would have added to the already long piece of code I used to create this simple D3 pie chart. Google charts is a library developed by Google. It has a lot of chart types and if you ever used apps from Google like Google Analytics you already saw it in action since thats how the dashboard is created. As D3 it also uses SVG to create charts. 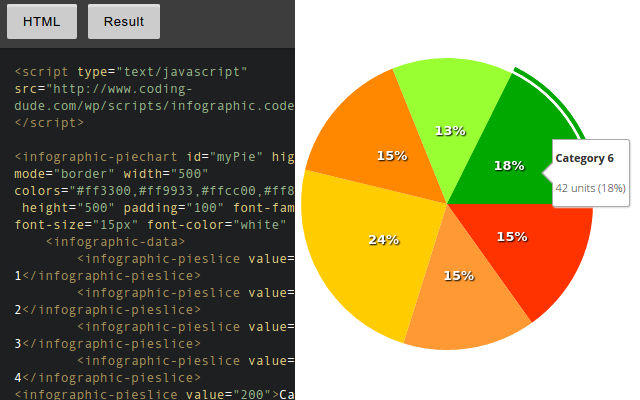 See the Pen Google Charts Piechart Example by Ion Emil Negoita (@inegoita) on CodePen. Here is the link to download & install Google Charts and the Google Charts documentation and examples. Conclusion about making a Google Charts pie chart: The initialization of the chart and the preparation of data was a bit of trial and error until I got the hang of it. Documentation is good and it’s very nice that there are a lot of customizations that you can add to a chart. All-in-all a good impression. See the Pen Infographic Tags Library Piechart Example by Ion Emil Negoita (@inegoita) on CodePen. Here is the link to download & install Infographic Charts and Graphs Tag library and the Infographic Charts and Graphs Tag library documentation and examples. One last remark I want to make about this library is that it also has an extension built on top of it for WordPress. It’s called Charts and graphs WordPress Visual Designer and it allows visually setting up a chart right in your blog posts. This is exactly what I used for the pie chart below. Hope you enjoyed this post about making a simple pie chart. All these are client side libraries, so they run inside the client browser. If you are interested how to hook charts to data taken from the database, here’s a nice post about making a pie chart with PHP and MySQL. “Infographic Charts and Graphs Tag library pie chart” is it free to use ?? in the provided download link it is asking to pay..